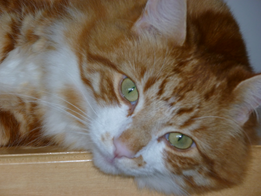 Meet Dinsdale, a silly ginger fluffball with a character several times his, admittedly substantial, size. Those in the village having made his acquaintance will testify that he is gentle soul, quick to purr and trusting to a fault. Yesterday afternoon he was shot at close range with an air rifle by person or persons unknown at the rear of our house and is currently under the care of those wonderful people at the Cedars Veterinary Surgery in Alton. He is stable at present, though heavily sedated, with a nasty injury to his lower jaw and a similarly nasty multiple fracture to his shoulder. He will be making the journey to Bristol on Friday to meet an expert orthopaedic surgeon who will attempt to remove a number of large pellet fragments, one of which is lodged in the fracture. If he is lucky he may remain a quadruped – very lucky that is. Both the Police and the RSPCA are taking a keen interest and would like to hear from anyone who may have noticed anyone hunting with an air rifle recently in the vicinity of Inverallen the adjacent yard and the allotment area. Police Constable Louisa Whatmore is managing the case and may be contacted either via email at louisa.whatmore@hampshire.pnn.police.uk or by dialling 101. I will update further if we discover any more about the particular circumstances in this case but in the meantime Please be very careful with your cherished pets. There is a special place in hell reserved for those who offer cruelty to animals, and for the particular individual concerned I would gladly hold open the door.